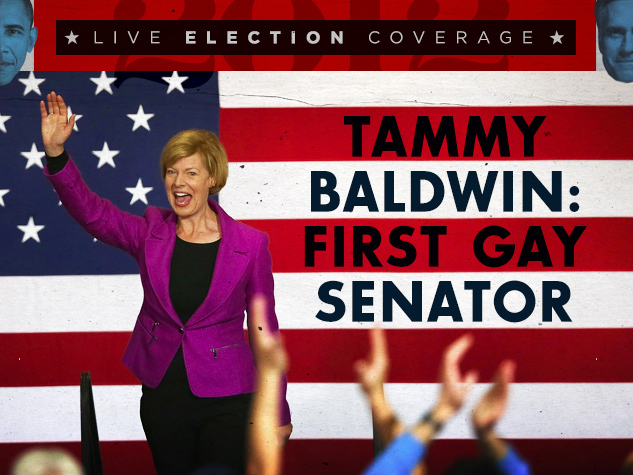 Tammy Baldwin was called a “radical lesbian” in her quest for a seat in the U.S. Senate. Turns out Wisconsin voters didn't take the bait. Kuhner warned about Baldwin’s “lesbian lifestyle,” predicting “increased child abuse, higher rates of drug addiction and alcoholism, soaring violence and rampant teenage promiscuity” as a result of her election. Well, Kuhner better prepare for the apocalypse because Tammy Baldwin has just declared victory in her race, with Victory Fund and Fox News both calling the race in her favor. Baldwin's Republican opponent Tommy Thompson has a favorite talking point: “Tammy Baldwin is so liberal that even Nancy Pelosi has to turn left to talk to her.” Although Baldwin isn't the most liberal member of the House, the most recent of National Journal’s annual vote ratings concur that Baldwin is the more liberal of the two, ranking Baldwin at number 21 on the list of most liberal members of the House, with bogeyman Pelosi at number 79. Since this isn’t the first time Baldwin has been called a “radical lesbian” (though one assumes Kuhner and his ilk aren’t familiar with actual “radical lesbians” from the 1960s like Rita Mae Brown) and according to the Washington Post, exit polls showed that Wisconsin voters didn't care that the soon-to-be Senator is gay, we still decided to examine what the political platform and voting record of a “radical lesbian” such as Baldwin really looks like. Baldwin says she stands up against "powerful, corporate special interests" and says that "fighting for Wisconsin’s middle class" is her top priority, noting jobs shipped overseas, stagnant wages, dwindling retirement accounts, rising health care costs, and the rising cost of college tuition. - She voted against extending the Bush-era tax cuts. - She is the lead sponsor in the House of Representatives of the Buffett Rule (which would make millionaires and billionaires pay more in taxes). - She voted against repealing the Glass-Steagall Act, which divided investment and commercial banking. The repeal won, a move that many experts say helped cause the 2008 economic collapse. - She fought for stronger tariffs on China and against what she says are unfair trade deals with China and Central and South America, saying they encourage outsourcing and lead to job losses in Wisconsin. - As part of the Congressional Progressive Caucus, Baldwin offered a budget plan that would raise taxes by $3.9 trillion over 10 years and reduce the deficit by $5.6 trillion over the same time.